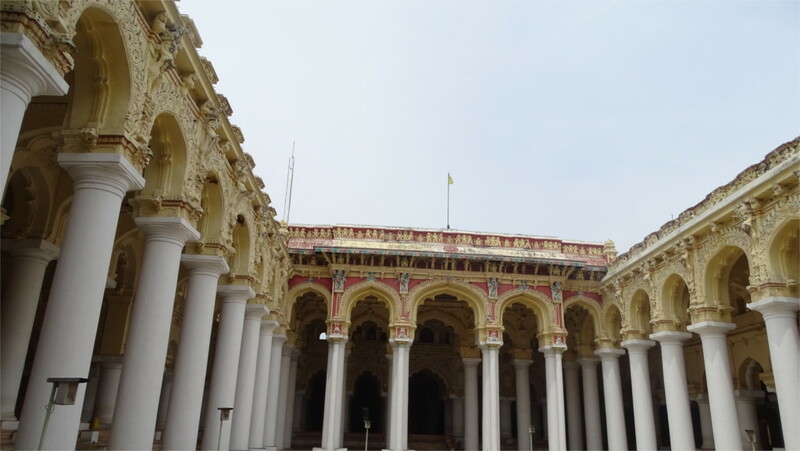 Madurai shares with cities like Patna, Banaras, Ujjain and Mathura, the distinction of being among the world’s oldest continuously inhabited cities. I use the word city quite deliberately here, because in every era, starting about 2700 to 2500 years ago, when travelers describe these places, they are called cities. Although I’d spent a while living in Chennai, I’d not explored Tamil Nadu much. The heart of the Tamil cultural landscape, Madurai, was a whole new experience, and one that I realized I could grow to love. Some of the reasons are the food you get in Madurai. I’ve written about Chettinad food already. 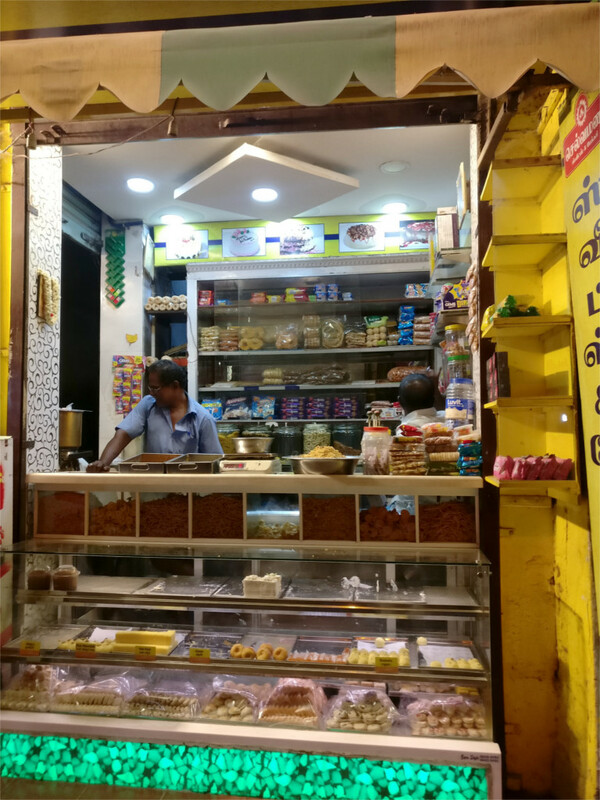 Here is another example: a signboard that might be hard to find in Chennai, and, increasingly, in the rest of India: “Sri Balaji Evening Mutton Stall”. 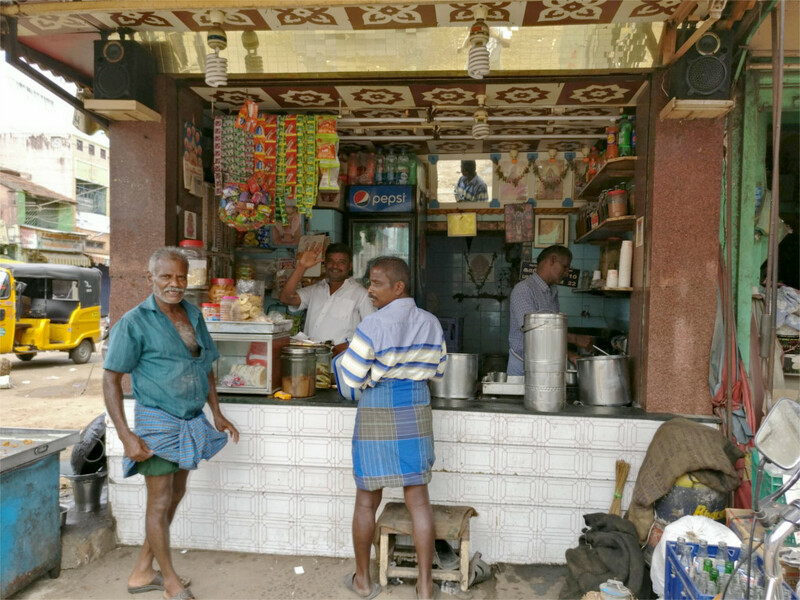 The street food of Madurai has to be tasted to be believed. The Family and I have fond memories of idli and vada with sambar and three kinds of chutney in a little hole in the wall in the old town called “Murugan’s Ildi Shop”, laddu and murukku from a stall inside the Meenakshi temple, coffee and biscuits at numerous stalls across the city, not to mention two wonderful lunches at two different “messes”. 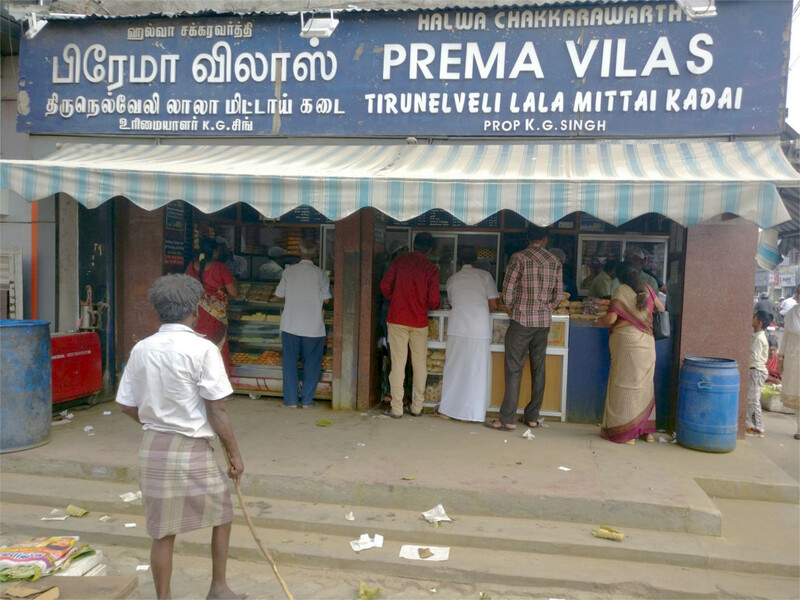 In the photo above you see a place where Sathiamoorthy took us to taste Tirunalveli halwa, a mildly sweet and oily halwa wrapped in banana leaves. Many blogs advised us not to miss this, and we are happy to pass on the recommendation. Part of the fun in Madurai was having Sathiamoorthy drive us up to places we would not have thought to try eating in. We have seldom had the luck to travel with a driver like him. 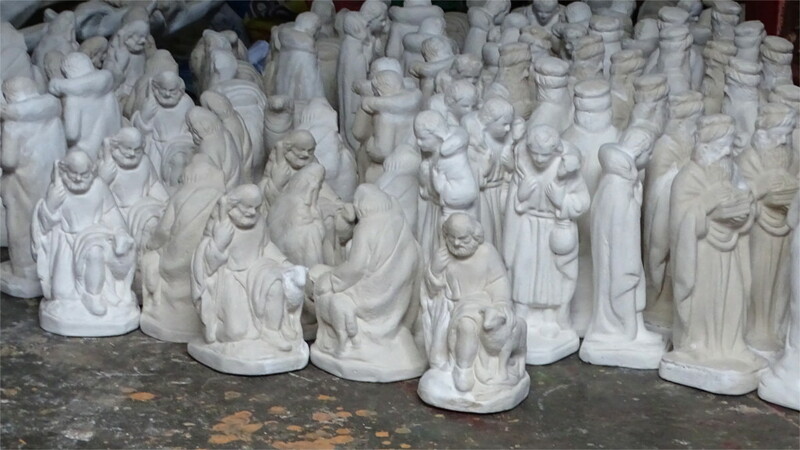 The Family and I walked into a store room full of painted plaster figures ready for shipping. Three people were busy packing things into boxes and did not mind us walking around and looking at things. 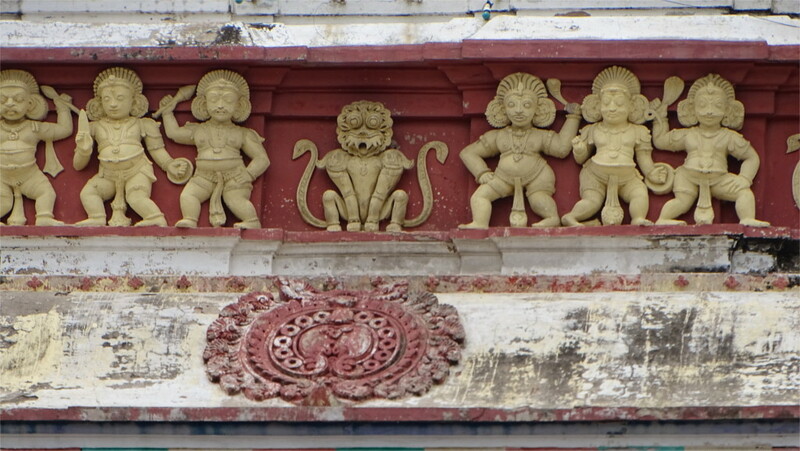 These were not high art, like some of the statuary we had seen in the Meenakshi temple. As you can see when you look at the gallery below, they are kitsch: mythological figures, figures from popular TV serials, scenes from a traditional middle class Tamil life. But it is amazing to be surrounded by thousands of such figures. After some time they can begin to look faintly menacing, even with their cheerfully bright colours. While I was lost in fantasies of fighting off hordes of bright blue cats, The Family had made a few purchases and needed my help in having them packed safely for a flight. Magic creeps up on you slowly as you walk through the village near Madurai called Vilachery. People who asked us to visit this place told us that it was a potter’s village. Initially that conjured up images of potter’s wheels, and ranks of pots and jugs. Then, slowly, as I began to realize that Tamil visual culture is steeped in clay images, a vague other image started taking shape in my mind. Sathiamoorthy parked the car in a widening of the dirt road through the village, and we started walking. The first indication that something sparkled in the air was the door in the featured photo. Headless angels and a madonna with a hidden face? “The game is afoot,” I told The Family. I need not have bothered. She’d already found a workshop behind blue doors. “Who’s next?”, she asked. We peered through the door. Nobody was home. The whole row of houses here had workshops attached to them. We walked on, peering at courtyards piled with large and small statues. In a very real sense, this was the heart of Tamil culture, at least its visual expression. I was glad we had decided to come here. 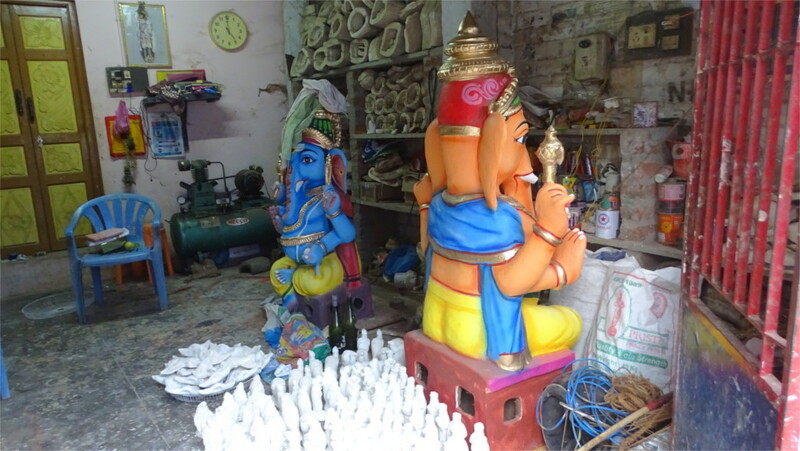 In another lane in the village we came to the workshops of those who use clay. In a little opening around which two of these workshops clustered, we found a smoking heap of straw. In the straw were many different kinds of figurines, but several of each type. Again, economics dictated that multiple copies of each be made. This row of workshops seemed to specialize in moulded plaster. I guess the ability to make many copies with molds is way to make a steady income. 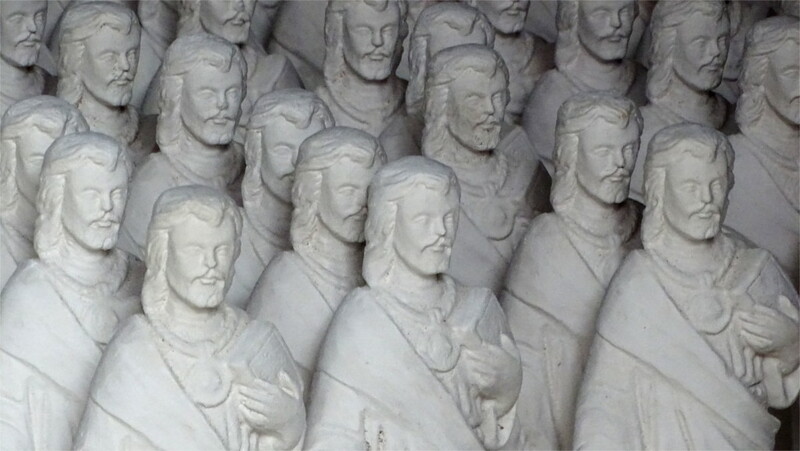 I peered into a workshop and saw a whole battalion of the figures that you see in the photo above. A woman sat near them and was hand-painting them one by one. She had several day’s worth of work ahead of her, I guessed. I looked through an open door and found a workshop of a slightly different kind. Two large Ganesh sat here. They were clearly individually crafted, since their postures were slightly different. The master spoke only Tamil, but with Sathiamoorthy as an interlocutor I figured that a framework is built first in bamboo and straw, and then clay is applied over it. Similar techniques are in use everywhere in India. This was a two storied house. I’d assumed that the ground floor was the workshop and the upper floor was where the master and his family lived. 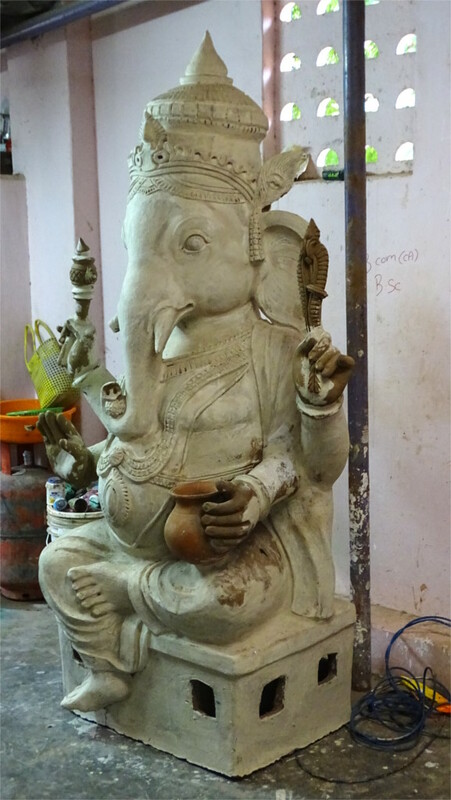 As I wandered past the blue Ganesh, I saw the marvelous sight which you can see in the photo above: a large clay statue of Ganesh in a kitchen. Where is the mouse, I wondered. Has it wandered off into the kitchen? Even though the master worked on such large pieces (individually commissioned) the workshop did not disdain the plaster figures that others made. In one corner of the workshop there was a company of figures, made up of small platoons of several different kinds. The history of globalization since the 16th century can be seen in these figures: they bring together influences from India, Europe and China. At the northern corner of the Swarga Vilasa, a small door connects to an ornate room called Natakasalai. The name seems to imply a theater, but the information that you can read on your way in implies that Thirumala Nayak lived in this area. Other areas in the now vanished palace complex had uses which would need a theater. I could steer a middle step in guessing, and say that this could well be a private audience chamber. It is ornate enough to befit one of the richer kings of the south, whose kingdom encompassed a large part of modern day Tamil Nadu, and some portions of Kerala and Karnataka. The featured photo looks eastwards down the length of this hall. The center of the room is sunk a little below the level of the Swarga Vilasa, and on the east the space resembles a raised stage. It reminds you of a modern theater with its raised stage and low seating. But in the 17th century the king would not have sat at a lower level. If this was used for dance or theatre, then the performers would have been in the center, with the king seated to the east. If this was an audience chamber, then again the king would have sat on the platform in the east. The decorations here are finer than those outside. There were the usual winged lions rampant on the finials of the pilars, but below them the ornate leaves and vines were much finer and more delicate than the beautiful work I’d already admired in the outer chamber. I have not seen such fine work in clay before. This area is used as a somewhat haphazard museum. Some of the sculptures on display are interesting, but perhaps the most interesting are the pillars with epigraphs which are kept in a small and bare side chamber. My first sight of Thirumal Nayak’s palace knocked the breath out of me. When I recovered I walked along the side gallery of the audience chamber, called the Swarga vilasa. When you do this you cannot help noticing how closely the thick pillars are set. If I hadn’t known it already, this would have been my first realization that the palace does not use stone. Stone pillars could be more slender. These pillars are made of clay, excavated from the teppakulam of the Vandiyur Mariamman temple. I walked down the corridor and looked up at the cupola in the corner. Using clay as a building material has its constraints. Walls and pillars are thick, and getting enough light into a space requires different solutions. The syncretic architecture that had grown after the incursion of the Delhi sultanate into Madurai offered the beautiful solution which you see in the photo above. A cupola in the roof allows space for a whole series of windows which let in light. I admired the technicality and the beautiful design on the roof. The light filters easily down, lighting up a large pride of lions which looked down their noses at me. This was more work in clay. Madurai is not very far from mountains, and transporting stone would not have been out of the question. A professional historian would be able to shed more light on the choice of building material: was it economics, or familiarity with the material which led to the use of clay here? 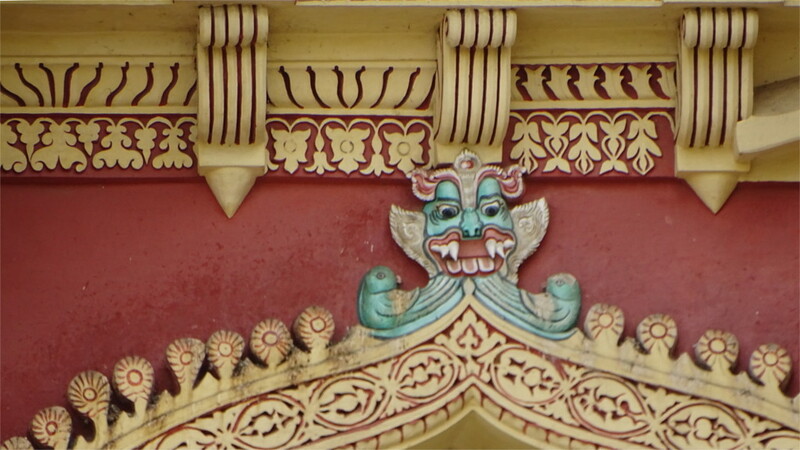 After all, the Meenakshi temple, rebuilt during the preceding century uses stone. Why not this? I walked down the side gallery to the space behind where the king would make his appearance. The space is vast, but broken by pillars. The vistas that greet you inside the Meenakshi temple are absent. 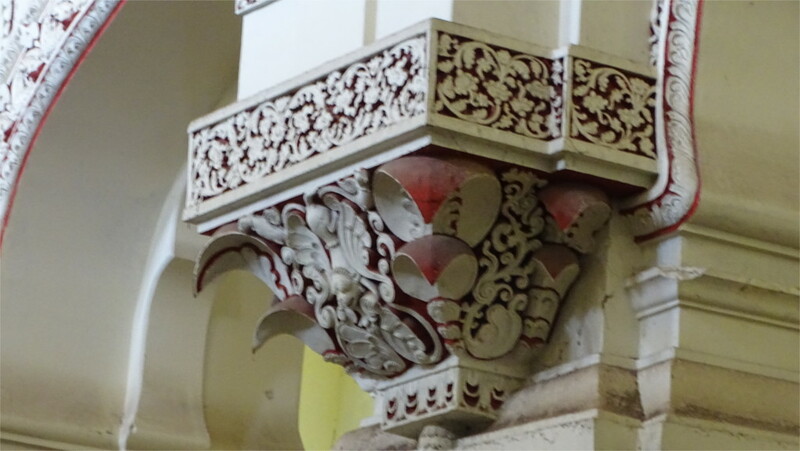 The pillars are said to be coated with a plaster made from powdered sea shell bound together with egg protein. The smooth white finish has attracted a generation of people to express their thoughts in pencil and ball pen, in defiance of notices which request people not to do so. If you thought that the internet is where you see the most interesting opinions, you could be wrong. The largest dome on the roof lies over the center of this space. 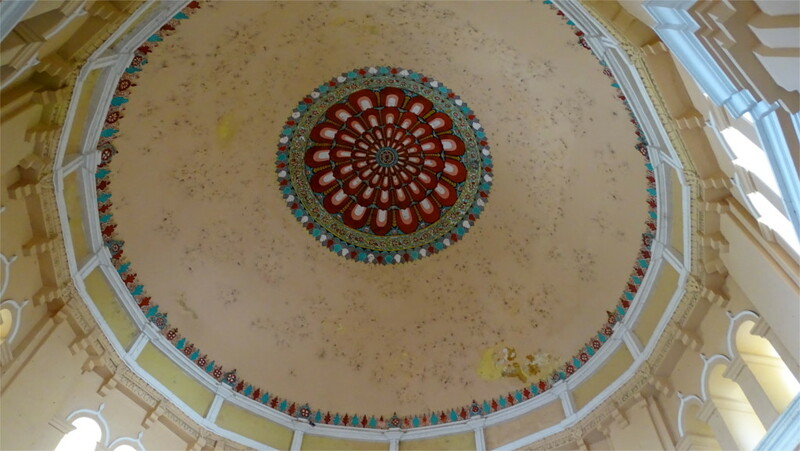 Every tourist stops below it to gape up at the interior of the dome. I decided to go with the flow. It is worth it. The ceiling is beautifully decorated, and there is enough light to admire this by. The complex is maintained by the state archaeology department. Typically departments such as this are starved of funding; even more so than health and education. In spite of that, I thought that they have done a fair job of maintenance. Next to the central dome there seems to be a smaller cupola. 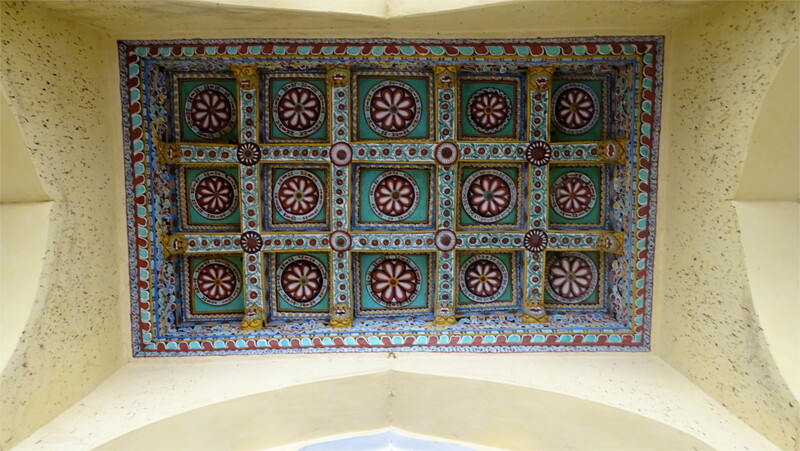 I looked up at the painted ceiling; it looked coffered. Was it trompe l’oeil? I walked around below it and saw from the change is perspective that it really was coffered. I didn’t see any structural reason why this part of the ceiling needed strengthening. Perhaps it is something that is only visible from above. The design was spectacular, what ever the reason. The area where the king would have sat is architecturally interesting. A series of cupolas and domes let in a lot of light, so the king would never be in darkness. 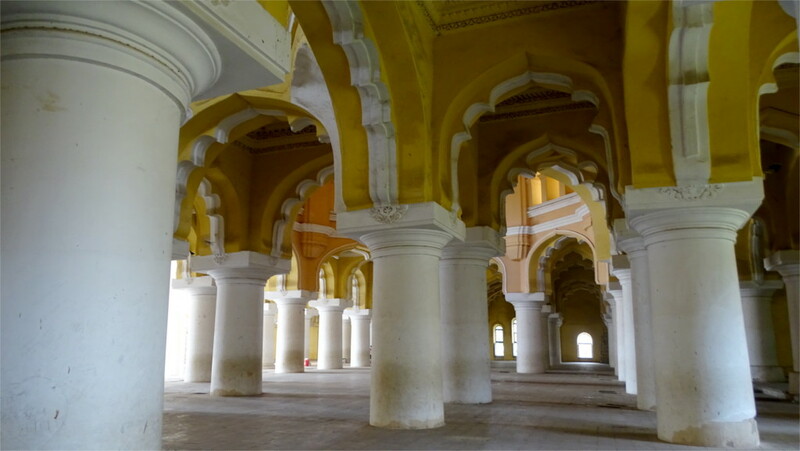 The central cupola and the arches could also have been designed for its acoustics. I could not test that, but it seems possible given the shape of the area. Just in front of this is a vestibule and steps leading down to the courtyard. The vestibule is crossed by rods which could have held fans meant for ciruclating air through this whole area. 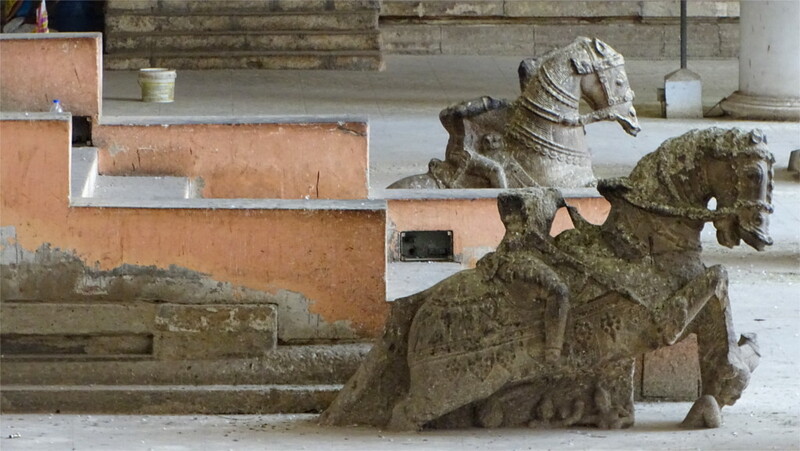 At the bottom of the steps were two beautiful stone sculptures which at one time would have shown horses with riders. The riders had been cut off quite expertly. It looks like planned plunder. The balance of probability is that the busts of the riders are gracing a collection somewhere in the wider world. After the fall of the Vijayanagar empire, their viceroy in Madurai, Vishvanatha Nayak declared himself king of Madurai in 1529 CE. Thirumala Nayakkar became king almost a hundred years later, in 1623 CE. His palace is one of the stops on a tourist circuit of Madurai. It didn’t look like much when we came to it. 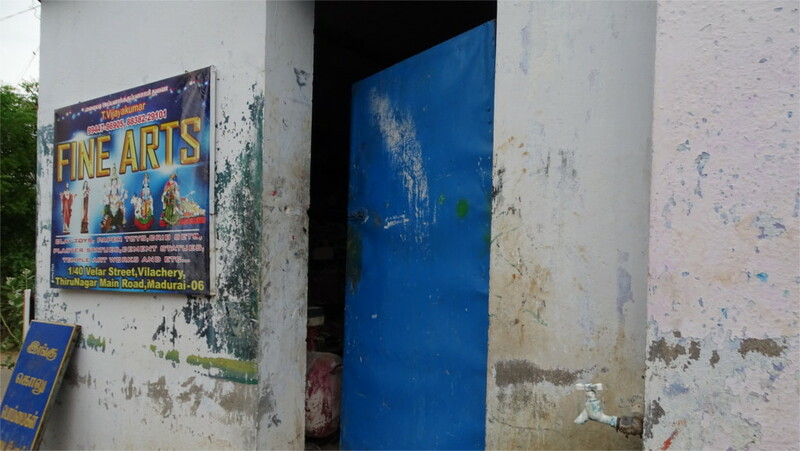 So our first view of what we saw when we entered the door (see the featured photo) was a shock. That wonderful soaring facade stood at the end of a large courtyard. The place felt like a court, a place where a king can make a ceremonial appearance. My guess was not incorrect. 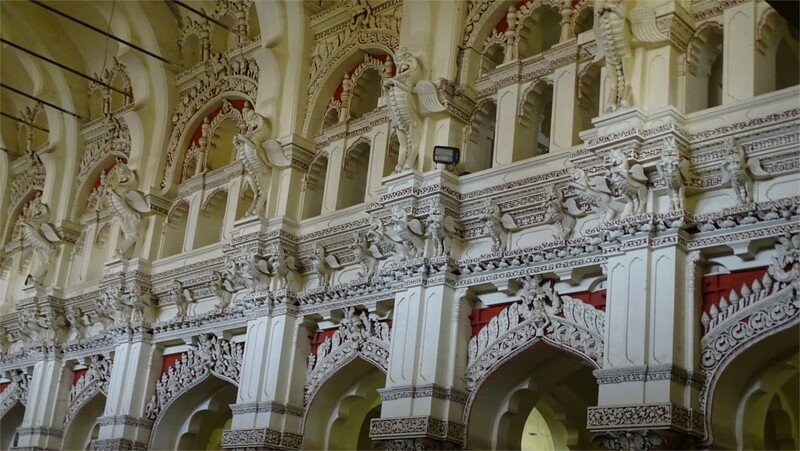 This part of the palace is the audience chamber, known as Swarga Vilasam, which one can loosely translate as Heaven’s Court. One reads that the rest of the palace was destroyed in the 18th century CE. I could not find the circumstances in which this destruction took place, but it would be interesting to read more about it. There is a sound and light show every evening in this palace, and the courtyard was filled with rows of chairs for the show. 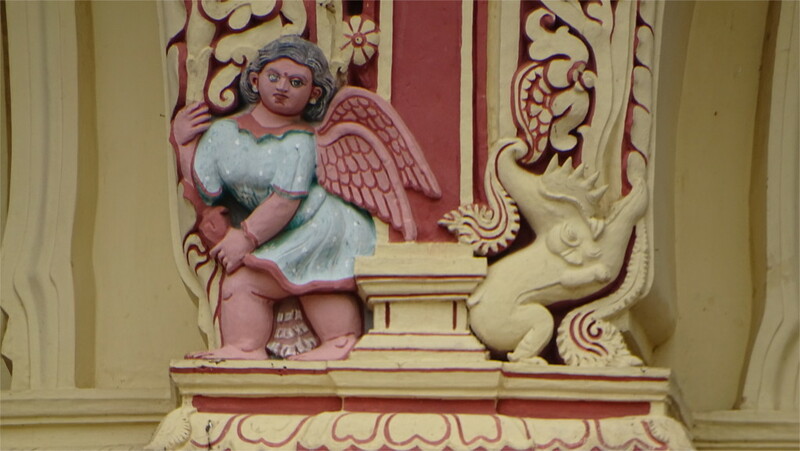 I sat in one and admired the clay images which decorated the facade. During this trip I began to realize that a common cultural thread which runs through medieval and modern Tamil society is the wide use of these decorative clay images. Th winged lion, whose photo you see above, is a particularly nice example. I was initially a little surprised to find a representation of an angel in this court. But on a little reflection I remembered that the first Christian churches were built in Madurai with the permission of Virappa Nayak, Thirumala’s father. Since I’d seen the cathedral decorated with clay images, it was clear that local artists had already learnt to use Christian symbolism. A winged human is not so different from other imaginary winged creatures after all. 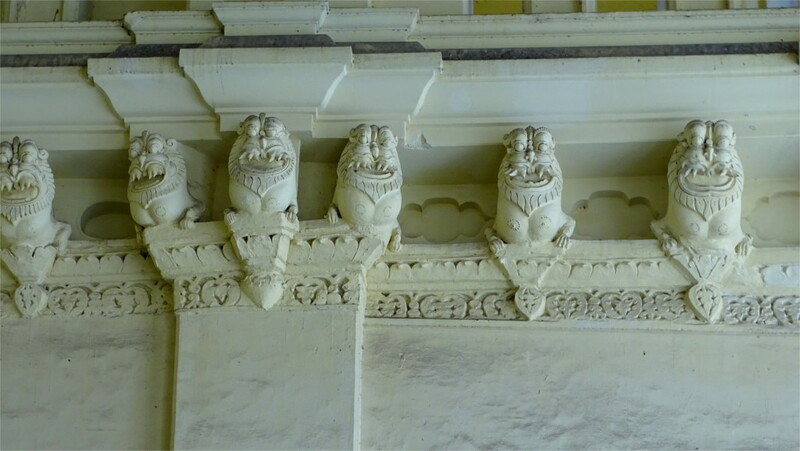 The Makara recurs throughout the palace. This one caught my eye because of the two parrots which float in its beard. The decoration on top of the arch and the supports above it are incredible. I was astounded by the wealth that this symbolized. A pity that a large part of the palace is gone, taking much human ingenuity and artistry with it. I must remember to try to find out when and why the rest of the palace was pulled down. 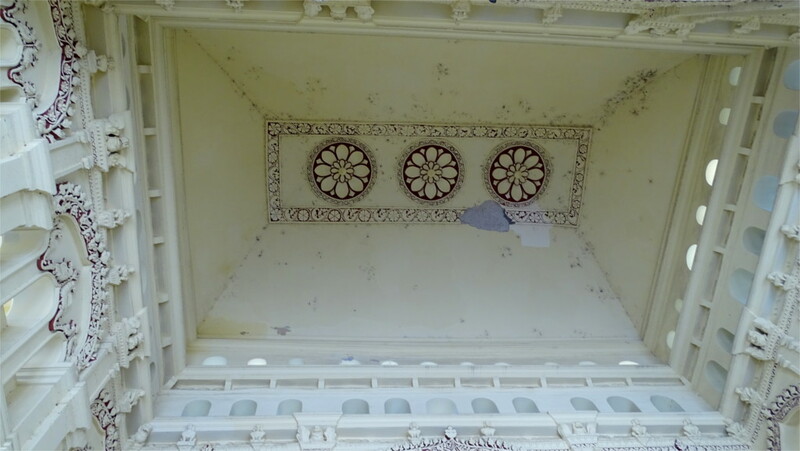 Finally I shifted my attention from the arches and pillars to the decoration in the top layer of the facade. These are equally complex. Lions and snakes separate groups of three warriors. In our machine age we fall into an assumption that if a pattern is repeated, then every repeat is identical. But in the early modern age, when this palace was built, this was not true. Every bit of the pattern received individual attention. So the groups of three warriors are all different. In these two groups, see how individualized each warrior is. Even the stances of the warriors are slightly different, somewhat individual. 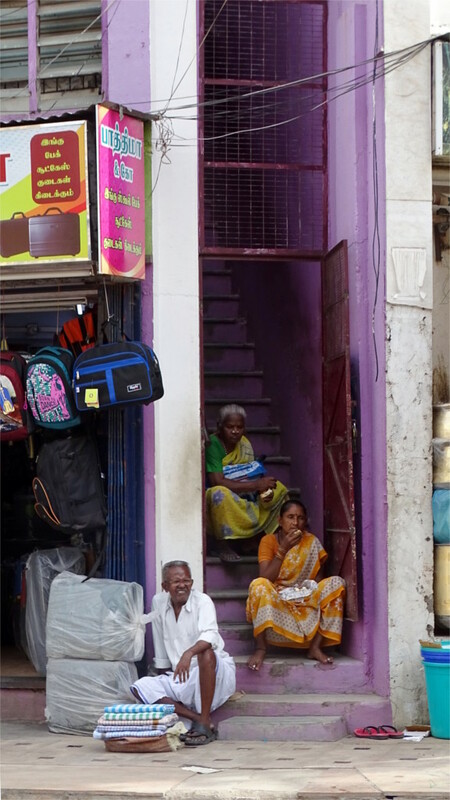 Walking about Madurai, I found that people notice you with a camera. Although Madurai is a big draw for tourists, most people are not as blase about tourists as people from south Mumbai. I spotted this trio chatting as they manned a fruit stall and thought I would take a photo quietly. Not possible. They turned their attention to me. It makes for a nice photo, but I can’t decide whether the other photo would have been better. Nearby was this bakery. I caught this man unawares, but now I’m not sure that this has come out well. I’m a little puzzled by the establishments called bakeries in Tamil Nadu. They are shops which do not seem to be attached to a place where someone bakes. About half the stock is usually unbranded material that a bakery would produce, but the other half is packed biscuits and cakes. Earlier in the day I’d come across this friendly coffee shop, where several people turned to smile at my camera. I had to be friendly back, so I bought a cup of coffee. It was good. A month ago, on the occasion of Gandhi’s one hundred and fiftieth birth centenary, I wrote that I did not have any Gandhi memorabilia. I remembered later that it was not true. I had a photo of a memorial to Gandhi just outside the eastern wall of Madurai’s Meenakshi temple. It is a sign of the very high esteem that Gandhi is held in that this statue is placed so prominently near the very center of tradition in Madurai. 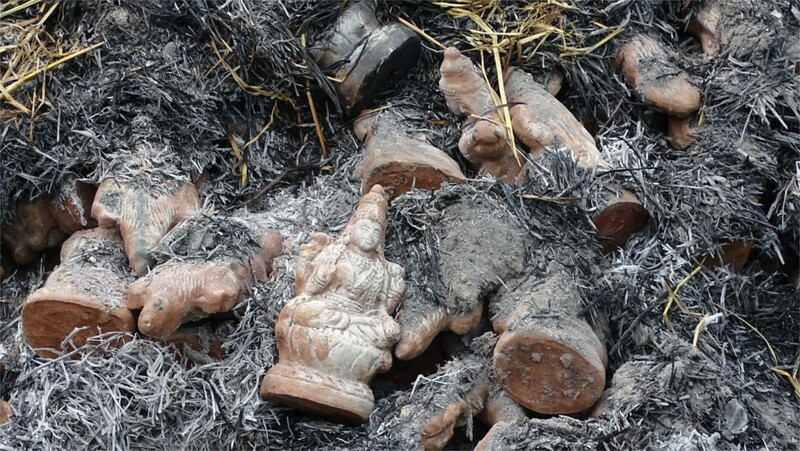 At the same time it is outside the temple, and not inside, with statues of gods and goddesses. A very calibrated placement, I thought. I post it a month late, but better that I post it now than forget it. I’ve saved the oldest of the gates of the Meenakshi temple for the end. This is the east gate, built between 1216 and 1238 CE by the Pandya dynasty king Maravarman Sundara. It is less than 47 meters high, and has just over a thousand clay images depicting scenes from the Puranas. 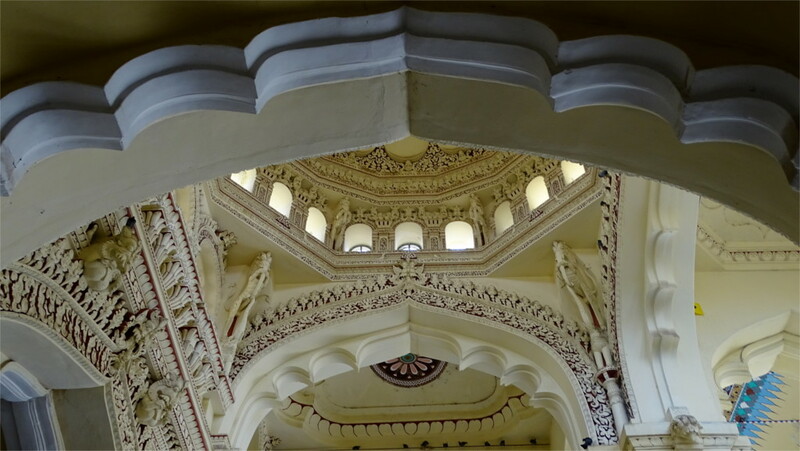 It is also special in that it stands over the main sanctum of Meenakshi. By the time I reached this place my confusion over whether this is a Shaiva temple or Vaishnava was resolved. As I found out, in one telling Meenakshi is married to Shiva in his aspect of Sundaresan, but she is the sister of Vishnu. This is the story you can see in one of the photos in the gallery. Shiva is shown with the moon in his hair, as usual. Vishnu can be recognized by the fact that he carries the Sudarshan chakra in one of his hands. I wondered whether I was imagining things, but these images seemed slightly different from those on the other gates. Compare the figures in the detail of the top rung of images with those from any of the other gates. The modelling of human features seems to be different. The lions are definitely different. Although the clay images must have been replaced many times, it is possible that a strict tradition governs them, so that they remain fairly true to the originals. If this is so, then these differences could be reflections of the difference in artistic styles that developed in the centuries which passes between the construction of the different gates. I am not an expert, and this is not an academic paper. So I am free to speculate. The Family and I walked through the densely packed rows of shops in the streets around Madurai’s Meenakshi temple one afternoon. It was quite hot, and the crowds of shoppers had thinned. This was a relatively slack time of the day, and we saw most shopkeepers in a relaxed mood. Two of them sat outside a brass shop chatting. It looked like Aladdin’s cave. The Family wanted to look for brassware. As she shopped I walked about a bit. Every one had a little time off. These three were probably street hawkers. They took some time out to finish lunch. I liked the way they are sitting together in a little group at the doorway of the narrow flight of stairs between two shops. I had to take a photo in passing, without giving them time to react. I can see the tiredness on their faces in this photo. If they’d noticed me then that slackness of expression would have been replaced by something else.